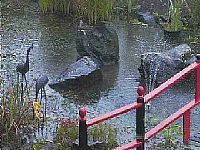 "Situated in the hills of County Antrim, Northern Ireland, this garden has been a labour of love since 1995 when the first sod for the pond was dug. Encompassing about 3/4 of an acre it consists of a Dry Garden, Tea Garden, Stroll Garden, and Water and Rock Garden. A planting of Japanese Maples, bamboos, grasses, ferns, Ginko Biloba, Hinoki Cypress,a giant Gunnera, some tree ferns from Tasmania (dickonsonia), Rhododendrons, Azaleas, and many native species add up to an interesting and indeed spectacular garden. A number of granite Japanese ornaments complete the picture for the visitor." See the web site for more information on the garden and how it was constructed.